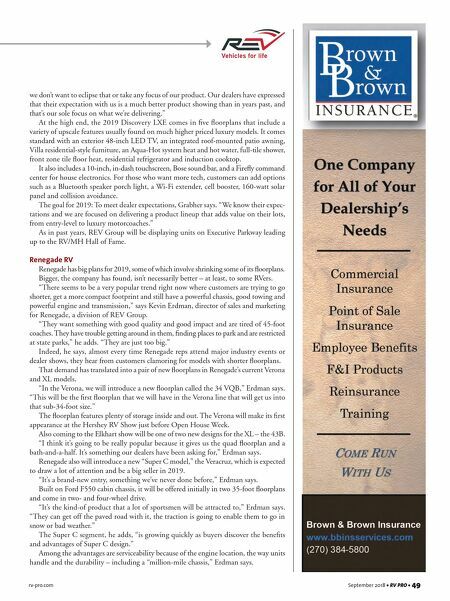 rv-pro.com September 2018 • RV PRO • 49 we don't want to eclipse that or take any focus of our product. Our dealers have expressed that their expectation with us is a much better product showing than in years past, and that's our sole focus on what we're delivering." At the high end, the 2019 Discovery LXE comes in five floorplans that include a variety of upscale features usually found on much higher priced luxury models. It comes standard with an exterior 48-inch LED TV, an integrated roof-mounted patio awning, Villa residential-style furniture, an Aqua-Hot system heat and hot water, full-tile shower, front zone tile floor heat, residential refrigerator and induction cooktop. It also includes a 10-inch, in-dash touchscreen, Bose sound bar, and a Firefly command center for house electronics. For those who want more tech, customers can add options such as a Bluetooth speaker porch light, a Wi-Fi extender, cell booster, 160-watt solar panel and collision avoidance. The goal for 2019: To meet dealer expectations, Grabher says. "We know their expec- tations and we are focused on delivering a product lineup that adds value on their lots, from entry-level to luxury motorcoaches." 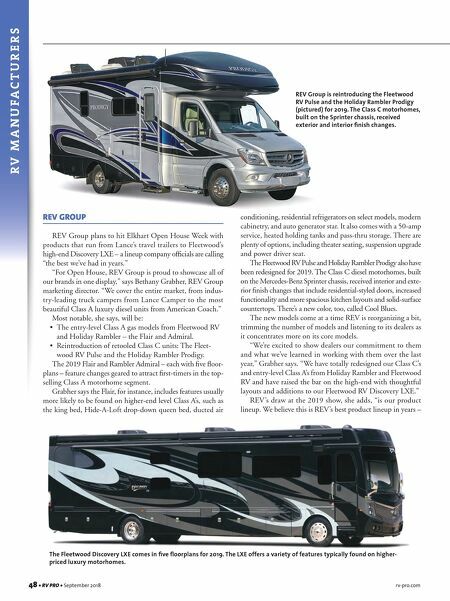 As in past years, REV Group will be displaying units on Executive Parkway leading up to the RV/MH Hall of Fame. Renegade RV Renegade has big plans for 2019, some of which involve shrinking some of its floorplans. Bigger, the company has found, isn't necessarily better – at least, to some RVers. "There seems to be a very popular trend right now where customers are trying to go shorter, get a more compact footprint and still have a powerful chassis, good towing and powerful engine and transmission," says Kevin Erdman, director of sales and marketing for Renegade, a division of REV Group. "They want something with good quality and good impact and are tired of 45-foot coaches. They have trouble getting around in them, finding places to park and are restricted at state parks," he adds. "They are just too big." Indeed, he says, almost every time Renegade reps attend major industry events or dealer shows, they hear from customers clamoring for models with shorter floorplans. That demand has translated into a pair of new floorplans in Renegade's current Verona and XL models. "In the Verona, we will introduce a new floorplan called the 34 VQB," Erdman says. "This will be the first floorplan that we will have in the Verona line that will get us into that sub-34-foot size." The floorplan features plenty of storage inside and out. The Verona will make its first appearance at the Hershey RV Show just before Open House Week. Also coming to the Elkhart show will be one of two new designs for the XL – the 43B. "I think it's going to be really popular because it gives us the quad floorplan and a bath-and-a-half. It's something our dealers have been asking for," Erdman says. Renegade also will introduce a new "Super C model," the Veracruz, which is expected to draw a lot of attention and be a big seller in 2019. "It's a brand-new entry, something we've never done before," Erdman says. Built on Ford F550 cabin chassis, it will be offered initially in two 35-foot floorplans and come in two- and four-wheel drive. "It's the kind-of product that a lot of sportsmen will be attracted to," Erdman says. "They can get off the paved road with it, the traction is going to enable them to go in snow or bad weather." The Super C segment, he adds, "is growing quickly as buyers discover the benefits and advantages of Super C design." Among the advantages are serviceability because of the engine location, the way units handle and the durability – including a "million-mile chassis," Erdman says.